We'll make it through all the worst together / And come out better than ever! The Pony POV Series is a completed My Little Pony: Friendship Is Magic fanfiction series written by alexwarlorn (with work put in by lz0291 (including the Shining Armor Arc) and Kendell2 (known as Godzillawolf on Fimfiction.Net) also wrote a few scenes and many of the songs before joining lz0291 as a co-writer for the Shining Armor Arc), as well as several stories written by others in the same universe. They can be read here (first volume, Discorded Ponies) and here (second volume, Reharmonized Ponies). You can download an e-book compliation of the Reharmonized Ponies stories to date in epub or fb2 format. 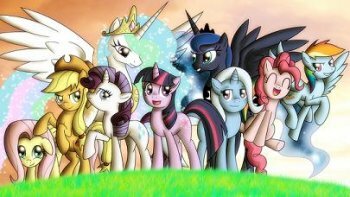 They also can be read at Fimfiction.Net: Discorded Ponies, Reharmonization, Pearls, Butterflies, Origins, Mind Games, Dark World/Shining Armor, 7 Dreams/Nightmares, Not The Wedding You Remember, and The Finale. Discorded Ponies Series: A series of fics showing the characters being corrupted by Discord from their perspective (including Trixie, who was never corrupted in the series). Nightmare Fuel abounds in all of these, especially the Alternate Ending "Epilogue", which takes place in a horrible Bad Future ruled by Discord. Dark World Series: A returning to the Bad Future to see if the cast can finally Earn Their Happy Ending. Eventually declared the Sequel Series to Discorded Ponies instead of an Arc. Reharmonized Ponies Series: A sequel series of all original works that follow the canon version of events. Unlike the original, these have a running storyline detailing the ponies' recovery, The Reveal that Trixie is a second Element Of Magic, and Discord's eventual return for round two, once more in a series of POV stories, though some break that formula. While much happier, Nightmare Fuel still abounds. Princess Gaia Arc: A continuation of the Reharmonized series, this one completely breaks Fluttershy where Discord couldn't, and in more ways than one. The "Butterfly" Side Stories: The aftermath of the previous Arc and Applejack breaking the series away from canon, as told from the POV of several Ponies and non-Ponies around Ponyville. "Origins": A series of stories explaining the origins of Celestia, Discord, Luna, and the end of the G3 World leading to the birth of the G4 one. Gets really dark. Shining Armor Arc: Shining Armor's backstory and explaining where he's been during the rest of the series. Wedding Arc: Included due to a poll result. The premise starts the same as the show canon, but things quickly spiral out of control, from the efforts of a much more dangerous Queen Chrysalis. Nightmare Ponyville Arc: Featuring Rainbow Dash trying to uncover the mysteries of an altered Ponyville she finds herself in. The Rumors Arc: The CMC (and Button Mash have to find a way to undo Discord's endgame and the rumors he used to cause it. The Last Battle Arc: It's time for a final confrontation with Discord. There's also the Gaiden: 7 Dreams/Nightmares collection of stories, wherein Princess Luna, Twilight Sparkle, and Pinkie Pie read the journal entries of the seven main G2 ponies, covering the G2 world's change into G3, the Cosmic Retcon of G3, and the collapse of G2 society in the altered timeline through their eyes. Gets pretty dark, but each story tends to lean towards Earn Your Happy Ending territory. Another pair of Gaiden Stories are The Rise of Tirek and Majesty, which are naturally the Origins Episodes for Lord Tirek and Majesty. All are rather deep, psychological stories with a Darker and Edgier take on the canon events. Discord is far more sinister and evil, his actions have left deep psychological scars on everypony, and there aren't any quick fixes to the damage inflicted. What separates this fic from many of the legions of fanfictions out there is just how HUMONGOUS the fic has become. The author regularly tries to create new chapters at a normal rate so that readers aren't Left Hanging, and the fanfiction as written by him is already over 100 chapters long. And not just short chapters. Average word length can be well over 4000 words in places. In addition, the fic has a core of loyal fans who are dedicated not just to creating new original material (as seen below), but for helping contribute to the core material such as the Dreams/Nightmares section mentioned above. Put together, it's quite the story with continuity, and top notch writing standards from its many editors and creators. A group of fans has started a project to make an audio version of the entire series , with a German-subtitled translation following right here . Another live reading has also started by a different person and has made it to the New Family Reharmonizing chapter. Discorded Ponies - Hater Sketch : One of the oldest pieces of Recursive Fanfiction revolving around a pony named Scribble Sketch and how Discord tortured them. Butterflies: Coffee Swirl (part 2 , part 3 , finale ), what repeated attacks by Mad Gods look like through the eyes of an average, ordinary pony. Butterflies: Ditzy Doo , an alternate portrayal, not to be confused with the unrelated Butterflies: Coffee Swirl. Part 2 posted after a long hiatus, Parts 3 , 4 , and 5 posted soon after. Pony POV Series: Sound : The story of how Discord tortured Octavia, and her recovery. S1lenc3 : Tells the story of how Vinyl Scratch AKA, DJ PON-3 got tortured by Discord and ultimately her recovery. Pony POV Series: Celestia: The Third Alicorn , explaining how Princess Cadence fits into the POV Universe. Discorded Ponies: Celestia: Not Loved : A short story depicting Celestia's Discording. Reharmonized Ponies: Celestia: Feared AND Loved : Celestia's recovery from her Discording, with help from the Interviewers, and indirectly from Twilight's friendship reports. Part 2 : Celestia meets with Queen Tiamat to get advice in her recovery and attends the Gaia Festival with Twilight. Pony POV: Cheerilee and Berry Punch is the direct sequel to Teacher With A Green Thumb , telling the story of Cheerilie's reconciling with her sister, Berry Punch. Civic Duty , a story telling about Mayor Mare overcoming her demons. Prince Blueblood: Reach For The Stars : A reharmonizing tale about Prince Blueblood not only recovering from his Discording, but from his own faults as well. Pony POV Series: Peachy Pie : A short story about a filly in Ponyville hurt by Discord and how her recovery presented in a child-like mindset. Pony POV Series: Sunny Daze : A sequel to the above from the POV of Peachy's best friend Sunny Daze (no relation to Sunny DAYS Celestia's alter ego). Pony POV Series: Shady Daze : Third installament to the above two involving Sunny Daze's big brother Shady Daze (no relation to Shady... probably). The Doctor Is Out : The story covering how the Doctor was Discorded. My Little Time Lord : The Doctor's Reharmonization. Big Blue Box and Big Blue Box Part 2 : The events leading up to and following Doctor's encounter with Princess Gaia. The Turn of the World : The Dark World version of the Doctor fights to reclaim his mind and soul from the Valeyard. The Weight of the Universe : The Doctor's mental battle with the Valeyard continues, with help from the souls of Sparkler and the Master. Time Lord Victorious : Following Nightmare Eclipse's defeat, The Master sets in motion a plot to come Back from the Dead. Lucky Rose : The Doctor relates the story of how he met his companion Roseluck...in the far future of Equestria's universe. Crazy Paving : Several of the Doctor's adventures with Rosy... and the sad tale of what happened to her. Pony POV Series: Carrot Top - Mean and Green : The story of Carrot Top's Discording and Reharmonization. The Valeyard: Lost Souls : A story of Dark World, following the Valeyard as he is condemned to Pony Hell, and takes a surprising journey with an unexpected companion. Pony POV Series: A Day At the Circus : A simple Slice of Life story about the ponies attending a circus that comes to Ponyville. Patch: Afterlife Aftermath : An epilogue to Patch's Gaiden story revolving around her entering Pony Heaven and who she meets on the way. Pony POV Series Gaiden: Starlight Epilogue : An epilogue to Starlight's Gaiden story revolving around her reunion with Ms. Hackney in the afterlife. Pony POV Series: Fluttershy's Bright Eyed Hobby : A micro story showing just what Fluttershy inherited from her past life Bright Eyes. 7 Dreams/Nightmares Side Story: Gusty - A side story for 7 Dreams/Nightmares Gaiden centering around G1 Gusty's point of view of the meeting with the G2 Mane Seven. Dark World Drabbles : A series of stories taking place in the Dark World timeline that 'reads between the lines' and depicts what the main series didn't, either due to space or because it focused on the mane cast. The first three take place during it (Twilight's actions directly after her HeelFace Turn, A Day In The Lime Light chapter dealing with the Apple Pie clan, and Discord reconciling with his mortal sister Shady II, but Word of God has stated future chapters will be a Sequel Series taking place after the defeat of Nightmare Eclipse. Adventures in Foalsitting : A short story recounting Cadence's early days as Twilight's foalsitter. Adventures in Sightseeing : Cadence recalls some more memorable moments from Twilight's childhood. Adventures in Camping : Cadence, Shining, and Twilight go on a camping trip. Seven Dreams on Nightmare Night : The first part of a mini-arc that may or may not be continued. The spirits of the G2 Mane Seven are allowed to return for one night, and decide to visit their descendants in Ponyville. Rainbowshine: Rainbow Factory : A weather factory employee recalls the hell Discord put her and her best friend through. Aloe and Lotus: Joined at the Hip : Aloe and Lotus tell the Interviewers about their Discording, and undergo their Reharmonizing. Cloudkicker: Rough Day : Cloudkicker has a rough day after Hurricane Fluttershy. Thankfully she has a little sister to return to. Sharing Love Lovestruck the unicorn has a special talent for helping beings find their love including her own. But with the events of the Finale arc on upon her, Love itself gives her the opportunity to become something more. Pony POV Amicitia's light/Twilight visit grim worlds : The journey into grimdark MLP fanfics that Epilogue!Twilight, now the Alicorn of Happy Endings Amicitia took between leaving her friends in the Dark World and her eventual self-destruction that created the Interviewers. These stories are Loose Canon and it's up to the reader rather or not to consider them canon. Several Recursive Fanfiction stories have been written in alternate universes as well. As such they are not canon to the main universe, but may be considered elsewhere in the same multiverse. The points of divergence vary, some in ancient past, some closer to modern day. Essentially, these are What If? stories. Shady: Line Of Fate : Another alternate-universe story by the same author. Warning, big time spoilers for the Origins Arc! Seeds of Magic : Another offical Alternate Universe staring an Applejack who became the Element of Magic. Part 2 , dealing with Magic!Applejack's first day of school. Part 3 , dealing with Magic!Applejack and Twilight being sent to Ponyville for the Summer Sun Celebration and Nightmare Moon's arrival. Seeds of Knowledge : The story of what Twilight was doing during the Summer Sun Celebration while AJ and the others went after the Elements of Harmony. Alternate POV Series: Discord World War by KyonSylar: Another official Alternate Universe: (Author Description) "Past and Future are not carved into stone, and each decision can change all the universe. Discord is in war with the world, and this time, he is not alone. The only hope for the world is that the mane six find the second holders of the elements, so that Discord can be stopped once and for all." Rough Diamonds by Zabuzaacolyte: A shocking and bold alternate course of events for the Reharmonization Series, taking place after Rarity's Reharmonization chapter, Ponyville awakens one morning to find a huge number of foals (including Applebloom and Diamond Tiara), have been kidnapped by the Diamond Dogs. But for what possible purpose? In true Pony POV series fashion, every chapter is another shocking reveal as nothing is as it seems. Pony POV Series : Epilogue Alternate by Saphroneth: Another official Alternate Universe, this time to Epilogue were Cadence decides to turn the tables on Discord by turning Trixie into an Alicorn. Pony POV: Friendship is Oppression : A look into the Harmony Queens timeline, as Twilight and her friends decide the only way to preserve harmony is to enforce it. Looking Glass Ponies (Part 2 , 3 , 4 , 5 , and 6 ): A look into a world where the wish-granting spell cast at the end of G2 went off without the flaws and an alternate G3 world was made. But can it avoid being erased as well? Pony POV Series Another End: Divergence : The fight with Discord in "Return of Harmony Part 2" ends differently. Recursive Fanfiction composed of contributions by the main author and fans in a role-playing/collaborative story style. After concluding the Finale Arc and retiring from writing fanfiction, alexwarlorn stated that the stories still in progress at that time will just continue without him due to their nature, simply acting as a passive host for the other writers. Pinkie Pie's Fourth-Wall Variety Show: A non-canon set of side stories, revolving around the framing device of a fourth-wall breaking "variety show" starring (usually) the Mane Six. Completed. Diamond Tiara's Variety Show : A Spin-Off of the Variety Show after it's conclusion with no connection to any other works. Diamond Tiara, Silver Spoon and the CMC come across the abandoned studio as it had served it's purpose. The rule is that it is only accessible to characters that went Out of Focus in the canon show. Once they have a prominent role before the series end, they can't come back. Ongoing. Cutie Mark Crusaders' Journal of the unexplained : Takes place between the Wedding Arc and Rumors Arc. The CMC decide to go on an adventure in the Everfree Forest, running into all sorts of mysteries. Completed. Ponies and Dragons (Just Have Fun): An In-Universe Ogres and Oubliettes campaign played by the cast. Ongoing. Fighting is Magic Tournament 01: A Let's You and Him Fight based tournament with the cast as participants. Completed. Fighting Is Magic Melee : A sequel to the above with an updated roster from FIM Season 7 and beyond. Ongoing. Now has its own recap page. A fan rereading of the story is also in progress. It was completed on 19 December 2018, with Alexwarlorn retiring and naming Kendell2 as the formal successor for future instalments. However, Word of God still declared it to be open season for Recursive Fanfiction that takes place after the ending.